My general for this Tale of Four Warlords #T4W is Admiral Ahdor Sailfin Anspear of the (Ironclad) 'Mathlann's Reach' who leads the premier fishing crew the King Fishers and their fleet which includes frigate class ships like the infamous 'AetherDance' and smaller grubhaulers (gunhaulers) which are often decorated to look like tasty treats to apex beasts in the aethersky. After the Pictures and Build + Paint sections, go read about a first face to face meeting he has with a Maneater named Crulg. He is kitbashed using the body of the Visarch, Sword of Ynnead (Games Workshop) and the head and sword of a Black Arch Fleetmaster (Games Workshop) and a pistol fashioned from the Wyches Drukhari kit (Games Workshop). He’s standing on a snowy mountainous basing scheme. 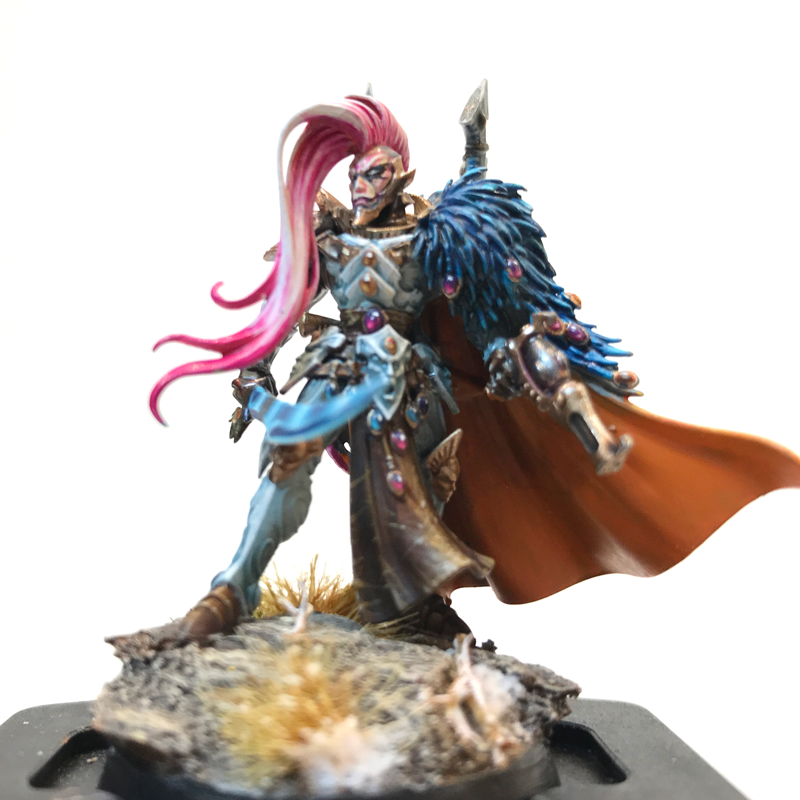 In order to bring the 40k Eldar aesthetic into AoS, I opted for more common materials like leathers and feather colors, and more vibrant offsets like the orange cloak and pink hair less common in grim dark space. It was a great opportunity try more worn out and scratched up leathers. Some organic looking ‘ivory’ armor. And a million bazillion jewels which I’d never painted before. It’s a simple technique, but it’s much more clear now that I’ve done it. A dock gong is struck by the meaty fist of an ogor. It’s high pitch warble travels across the pier catching the attention of some aelves loading a few small aether-craft they call grubhaulers. The crew leader lets go of the barrel he was about to lift and stands up. 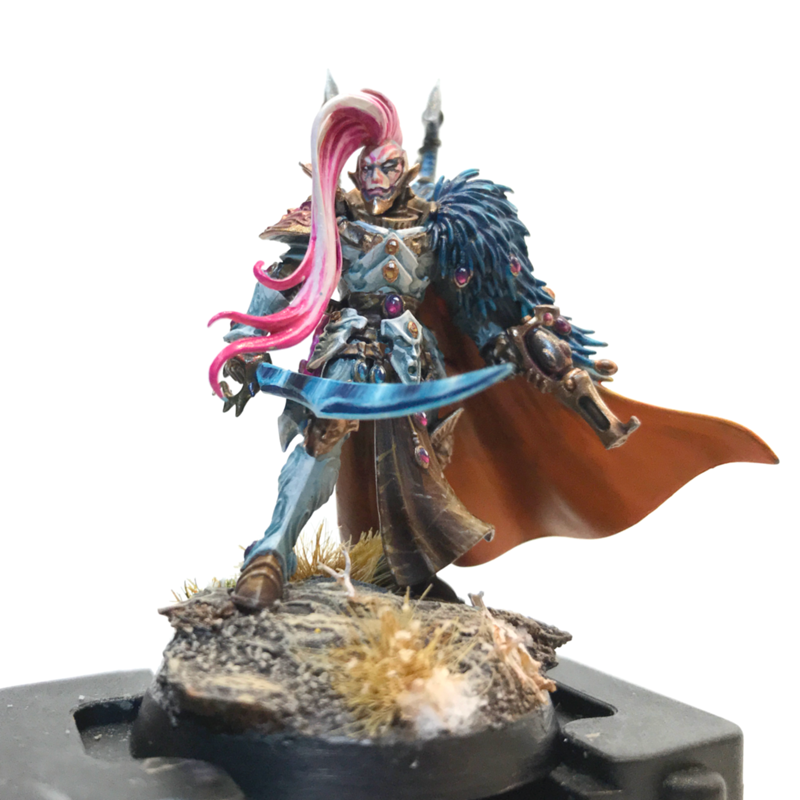 He and the crew are dressed in sleek breather suits of aelven make, in contrast to the clunky duardin “caskets” the Kharadron wear, though the styling is oddly inauspicious for a typical aelves. Oostraang nods, a muscular and svelt build, rather than the chunky build of gutbuster ogors. His uniform and tattoos mark his trade and service to the Mühle, a privateer force, “Dai (3) Ani, ‘e do. “Elui-no! (5) Sailfin does not meet under any circumstance!” Ani responds resolutely and turns back to finish loading the grubhaulers. Four grubhaulers leave the port, 3 of which are carrying Oostraang, another Mühle Ogor and Crulg, their leader, all trying awkwardly to fit inside the baskets of the light ships. “Your Admiral better be able to pay well for this information, Ani…” Crulg states authoritatively to Ani who is riding with him. Ani responds in feigned submission, “Sailfin is always fair with those who are willing to trade him what he wants.” to which Crulg gives an acknowledging grunt. It’s the only words either speak the entire voyage. They approach the aelven ship known as “Mathlann’s Reach” which is almost as wide as it is long, with multiple shallow platforms rather than a single deck and deep hull. One great sail arches from bow to stern, resembling the dorsal fins of the great ghur sailfish, the fastest animals in the skies. After mooring Ani’s grubhauler, He and Crulg jumps to the deck of the Reach to meet 30 or so crew waiting for their arrival. Surprised to see the ogor onboard, many put their hands to their pistol or sword. Some crew members chuckle as one steps out of the crowd holding a long sailfin cape with a feathered pauldron which he drapes around Ani’s shoulders. Another shipmate takes Ani’s nondescript rapier and hands him an ornate cutlass. His demeanor changes almost instantly to something more regal. Ani speaks, now as Admiral Ahdor Anspear, the Sailfin, “Senlui elthrai Crulg...we have much to discuss!” and the crew part as the two walk towards the upper deck of Mathlann’s Reach. Next month i’m going to either focus on the Maneater ogors mentioned in the story above, or the King Fishers. I always love defining an army by their core troops, and i’m excited to paint these sky-aelves and get some model count going. Also, it could be good to do some of the battleline now, so i don’t have to do all 20 at once in a future month. Go check out my fellow Warlords and their general entries!